She’d slammed the door to her room, so we all stood in the hallway not-so-calmly pondering what our next step would be. Unfortunately, there are some rather wide gaps around our door jams and a few minutes later this particular bat zoomed out from a crack and began circling and swooping above us. Naturally, we squealed and lunged toward the other two bedrooms. During the next hour, there were some pretty interesting conversations, both on and off the phone. By a little after midnight, we’d all piled on clothes and hesitantly crept downstairs to let in a most wonderful friend. 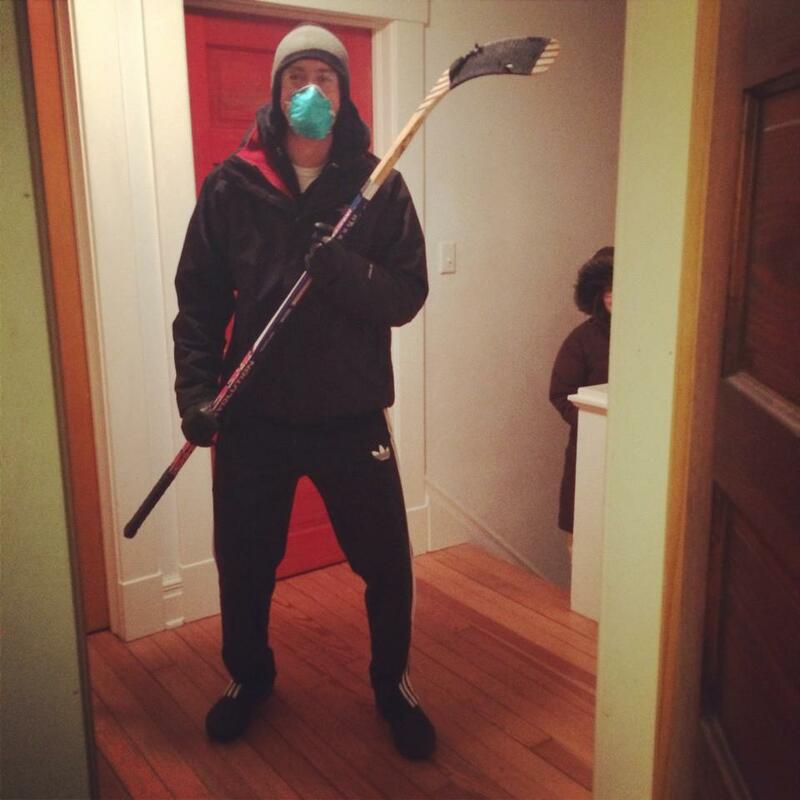 He’d come prepared, wearing an N-95 respirator and carrying a hockey stick. None of us were particularly enthused about the idea of going to sleep when the bat could have been anywhere, but we searched our bedrooms and then taped each other in, sealing the cracks around the doors. The next morning we met with our first bat man. He informed us that (1) there was evidence of a whole family of bats in our attic, (2) they were supposed to be hibernating but would wake up every 17-19 days to find water, and (3) it’s illegal to exterminate them. So we left the movie before it had started. My friend hurriedly packed up her stuff, holding the tennis racquet our neighbor-friend had delivered to her bathroom hideout. Hopefully she was less than completely traumatized. It was now clear we had bats in our house – bats that didn’t always stay asleep. I had a few scratches of unknown origin, and apparently you don’t always feel bats bite you if you’re asleep, so we started talking about whether we should go get rabies post-exposure treatment, or at least the prophylaxis vaccine. Sigh. We consulted the CDC, WHO, UpToDate, my roommate’s father, and my uncle as we drove toward the Emergency Room. There wasn’t really a “right” answer, but we decided rabies wasn’t something to mess around with. We were in for a pretty fantastic Friday night. We got to the ED around 10pm, left our car for valet parking, wandered in toward triage, and immediately ran into two friends on their emergency medicine rotations. 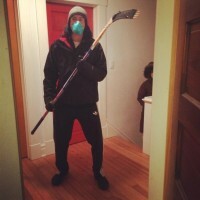 Of course, one was the fine gentleman who’d come over with his hockey stick, merely 48 hours before. By the time we each went back to a room, I was so tired I didn’t care in the least about having a sort-of-acquaintance M4 do a physical and take a health history. When he left, told me it’d be a couple hours before the doctor came back to make a decision, I turned off the lights and took a nap in the hospital bed. At 3am, I finally saw a resident who sent in orders for the post-exposure treatment. Tragically, the vaccine doesn’t take effect for at least a week, so in addition to starting the rabies vaccine, we also needed straight-up immunoglobulin. To get enough antibody, most people require about six syringes full on that first night. I was fine until the last one headed deep into my right thing, at which point I politely informed the nurse I was about to pass out. Apparently it was a slightly less-than-normal loss of consciousness, including posturing, animal-like noises, and turning purple, but I woke up a minute later, after a crazy-rapid series of dreams. It wasn’t the first time, so I tried to explain I’d be fine in a little bit and that the supplemental oxygen they were giving me was entirely unnecessary. They left me alone with my roommate for a while and when we saw I was satting close to 100% again, I slipped off the pulse oximeter and slipped on my jeans. It was 4am and we were ready to go sleep – at a hotel, not our house. Over the course of the next week, we consulted two more bat men about the situation. We taped our heating vents shut. We blocked holes in the walls. We sealed off our basement. 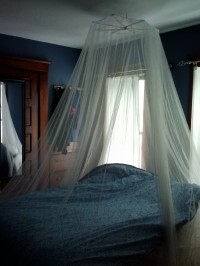 We got nets to hang over our beds. 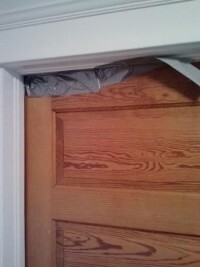 When it warms up, we’ll install a one-way door from the attic to the outside. Until then, we’re back to sleeping soundly, peacefully co-habitating with our bat family.